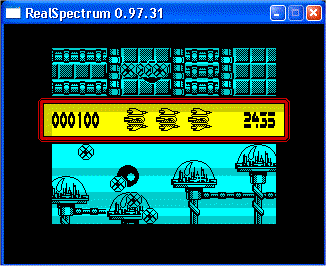 RealSpectrum is first among numerous Spectrum emulators which had practically 100% accurate multicolor emulation. It is probably most featured emulator available. 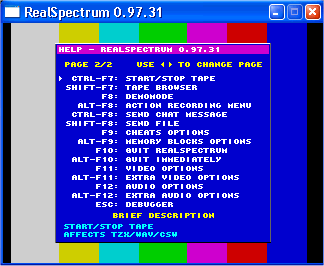 Current version is some kind mixed DOS-Win, menu usage is with keyboard. Everything is here, video recording works pretty fine. 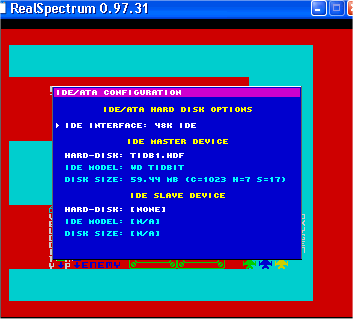 There is even emulation of some IDE harddisk interfaces. It works with image files of complete hard disks. Of course, custom ROM is then required. 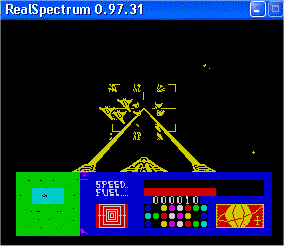 I tested it in 16-bit interface (Pera Putnik's) mode. On first try it loaded only short files. 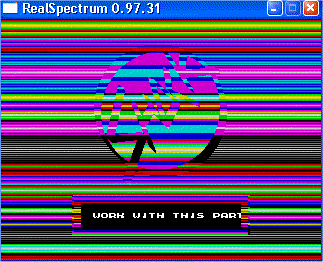 Then I modified zxide.rom so, that disc access is in single sector mode, and then it worked well. It means that IDE emulation is not complete. In any case very nice feature for Speccy harddisk (interface) owners.